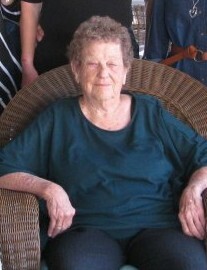 Obituary for Eva Pearl (Cook) Thomasson | Wheeler Mortuary of Portales, Inc.
Funeral services for Pearl Thomasson, 93, of Portales, will be at 2:00 P.M., Fri., April 12, 2019 at Central Christian Church in Portales with Pastor Don Thomas officiating. Burial will follow in the Old Runnels Cemetery near Ballinger, TX at 2:00 P.M. (CDT) on Sat., April 13, 2019. Pallbearers will Kim Willis, Tony Willis, Jimmy Dusenbery, Kent Dusenbery, Michael Willis, Brandon Edwards, Bryan Edwards, Charlie Thomasson and Larry Marquez. All of the former residents of her cottage at the New Mexico Christian Children’s Home will be honorary pallbearers. Eva Pearl Thomasson, known to most people as Pearl, was born Feb. 17, 1926 in Wingate, TX to the home of Mary Elizabeth (Pew) and Elmus Edward Cook and died in Portales, NM on the evening of April 6, 2019. Pearl grew up in the Ballinger area. On Feb. 1, 1945 in Ballinger, she was married to W. A. Thomasson. The couple had four children, a son and three daughters. The family made their home in Texas until 1958 when they moved to Aztec, NM, and then in the mid 1970’s they moved with Mr. Thomasson’s employment to Salt Lake City, UT. In 1978, Ms Thomasson moved to Portales to make her home. Later that same year she began working at the New Mexico Christian Children’s Home as a cook in Cottage #1. She later became the only single house parent the home has ever employed. At the end of 13 years, she retired from the home in 1991 and moved into Portales. In 2005 Ms Thomasson moved to Golden Acres where she resided until 2017. At that time she moved to her daughter and son-in-law’s home. As long as her eyesight permitted, she served as a Foster Grandparent at James Elementary School. She was a faithful Christian, and a member of Southside Church of Christ. Pearl loved to fish, and made many trips to Ballinger to go fishing with her brother, Cotton. She was very active in the Portales Community Center, and enjoyed doing crafts of all types. She is survived by three daughters and sons-in-law, Brenda “Sue” and Bob Dusenbery of Aztec, NM, Pat and Jack Willis of Portales and Debra Kay and Todd Averett of Salt Lake City, UT; a daughter-in-law, Evelyn (Mrs. Tony) Thomasson of Salt Lake City, UT; and approximately 100 other “sons and daughters” who were in her care at the home including Larry (Marisol) Marquez of Amarillo, TX who truly became a son to her; there are also ten grandchildren, Jimmy (Anne Marie) Dusenbery and Kent (Becci) Dusenbery[SR1] , Kim (Myra) Willis and Tony (Shannon) Willis, Amanda (Nick) Jarrett, Charlie (Natalie) Thomasson, Brandon Edwards and Bryan (Celisse) Edwards, and A. J. and Ariel Marquez; 13 great-grandchildren; and a sister, Wanda Fay Farmer of Plano, TX She was preceded in death by her parents; five brothers, Terrell, John, Rex, Cotton and Bill Cook; and four sisters, Allie Schultz, Mildred Harris, Rose Enochs and Bootsie Cook; and by a son, Walter Anthony “Tony” Thomasson, Jr who died in 2004.